Birding Is Fun! : Buckets for Birders! Attention all backyard birdwatchers! We have an opportunity to join with Firehouse Subs in a fun and simple way to save human lives and to improve our backyard bird feeding. 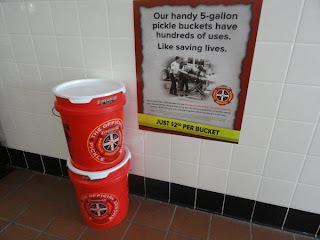 Simply visit your local Firehouse Subs restaurant, enjoy a delicious sandwich with steamed meat and cheese and purchase a five gallon Pickle Bucket for just $2. My favorite sandwich is the Smokehouse Beef and Cheddar Brisket and my entire family agrees that Firehouse Subs are the best sandwiches available on the market. Rather than toss them into a landfill, Firehouse Subs re-purposes their used Pickle Buckets by offering them to the public for a $2 donation which goes to the Firehouse Subs Public Safety Foundation. This money is used to buy life-saving equipment for firefighters, police, and EMT's. So far, $3.9 million dollars worth of equipment has been passed along through this awesome program in 29 states. Our donations literally help save lives, both the lives of first-responders and yours and mine. 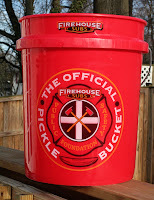 Firehouse Subs five gallon Pickle Buckets are great for storing bird seed and keeping it from mice and moths. You can use the bucket as a stool while birding. You might even find creative ways to turn your pickel bucket into bird feeder. There are thousands of other uses for a good ol' five gallon pickle bucket. Check out this CNN video of a Civil War archaeology dig and see which buckets they are using. Please join me in this fun and inexpensive way to save lives and enjoy the birds! When you purchase your bucket, make sure you tell 'em you're a birder. Please send us photos of you and your creatives uses of your Pickle Bucket and we'll share it here at BirdingIsFun.com. 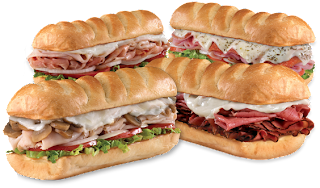 What I love about Firehouse Subs is that it is not a gimmicky themed restaurant chain. They are the real deal. It was founded by the Sorensen brothers who have 200 years of firefighting family heritage. If that were not enough, the way they give back to the community is inspiring and worthy of our patronage. When you visit one of their restaurants you will see for yourself the strong bond to your local community's first-responders. Their mission statement is "to carry on our commitment and passion for hearty and flavorful food, heartfelt service and public safety." Below is a real-life close-to-home example of Pickle Bucket donations at work. Firehouse Subs Public Safety Foundation donated extrication tools worth more than $20,000 to the Sandy City Fire Department, tools that would otherwise be unavailable due to budget constraints. The tools will replace the 20-year-old equipment currently used and will assist firefighters in saving lives by speeding up the extrication process in motor vehicle accidents. 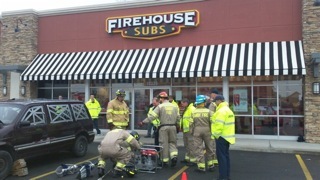 Randy Judd, Utah area representative for Firehouse Subs, tells of how just weeks after this donation, this jaws-of-life equipment was used to rescue some teens in a nearby car accident. Just yesterday, Firehouse Subs Public Safety Foundation donated a tactical body bunker - those shields used by S.W.A.T. teams - to the Cottonwood Heights Police Department as well as Bowring tools to the City of Orem firefighters. 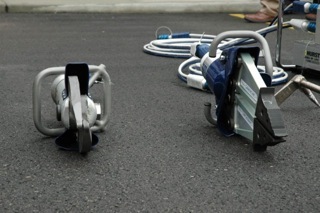 These tools save lives and they are made possible by Firehouse Subs customers. My family visited the Firehouse Subs in the Salt Lake area and had a great time. Kyle, Anne, Victoria, and Claire modeling firemen-wear donated by local agencies and displaying the beloved Pickle Buckets. Firehouse Subs has great kid's meals like grilled cheese sandwiches for my more finicky eaters. Randy Judd is passionate about the delicious food he makes and just as passionate about the great causes Firehouse Subs supports. He was fantastic with our kids, helping them become junior firefighters. Claire decided that her bucket works as a helmet, which gave me the idea that perhaps those folks doing owl surveys might appreciate a little extra head protection! You may need to go more than once since they migh not have any buckets when you get there. Good point. The buckets are only available as they empty the pickles out of them. LOL! So cute and such a worthy cause! I enjoyed this Robert, and it made me very hungry.